Springtime libations guaranteed to make your bunny hop. In recent years, Easter has become a popular brunch holiday when we gather with friends and family to enjoy food and drink and the promise of warmer weather. Given that it's also synonymous with spring, we should look toward lighter, fresh-tasting libations for the holiday meals. Here are some great cocktails and mocktails that are perfect for springtime sipping. The colorful holiday often involves egg hunts and kids, so let's not leave out those who are not yet of legal drinking age. Here is an excellent non-alcoholic refresher that will appeal to both kids and adults. To make a blackberry-lemon mocktail, begin by mashing a 1/2 cup of fresh blackberries with a 1/4 cup of sugar in a small sauce pan to break the berries down into pieces. Add 1 cup of water and a 1/2 cup of lemonade and bring to a simmer. Cook over medium-low heat for 10 minutes. Strain the liquid into a container and add the juice of 1 lemon. Refrigerate; once the fruit liquid has cooled, divide it into four glasses filled with ice cubes. Top each glass with club soda or seltzer and mix. Garnish with lemon slices, mint leaves and whole blackberries. 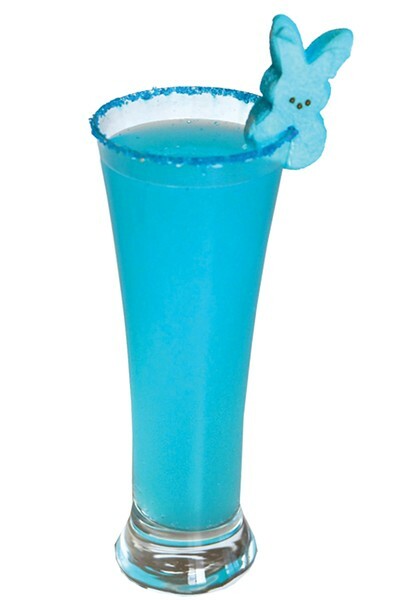 I really like this simple (almost healthy) Buzzed Bunny Easter Cocktail from the website gigglesgobblesandgulps.com. Into a shaker with ice, grate 1 small piece of fresh ginger root. Add 1 ounce of sweetened pineapple juice, 3 ounces of fresh carrot juice, the juice from 1/2 a lemon, and 1 ½ ounces of gin (try local Beehive Distilling Jack Rabbit Gin). Shake vigorously and strain over ice into a cocktail glass. Garnish with a mint sprig and lemon slice. Ever tried St-Germain? Each bottle is individually numbered and reflects the year (or "vintage") that the elderflower blossoms used to make it were picked in the French Alps. This gorgeous-tasting liqueur is one of my absolute favorites. A very simple but delicious drink for your Easter outing is the Left Bank Martini. Into a cocktail shaker with ice, pour 1 ½ shots of gin, 1 shot of St-Germain and 1 shot of sauvignon blanc. Shake, strain into a chilled martini glass, garnish with a lime zest twist and toast to your good taste. Another of my favorite springtime sippers comes courtesy of the folks at Tommy Bahama Rum. It's called the Velvet Rosa, and it's as tasty and lovely as it sounds. Pour the following into a shaker with ice: 2/3 part Tommy Bahama White Sand Rum (or your favorite white rum, such as local distillers Dented Brick, Outlaw, Distillery 36 or Sugar House), 1/3 part peach schnapps and 1 part cranberry juice. Shake and strain into a chilled Champagne flute. Top off the drink with Champagne, Prosecco, cava or other sparkling wine. Garnish with a small, delicate flower, if you wish. This cucumber-and-mint fauxjito is a refreshing, non-alcoholic take on the mojito that both adults and kids can enjoy. In a cocktail shaker, muddle together 6 thin slices of English cucumber with 6 large mint leaves. Once muddled, add 2 ounces of fresh lime juice and a 1/2 ounce of agave nectar; fill with ice and shake well. Strain into an ice-filled Collins glass, add 4 ounces of club soda, stir and garnish with a cucumber slice and sprig of mint. Ready for the punchline? Here is a very easy, pleasing Champagne punch recipe that you could modify to suit your tastes. In a large bowl, pour 1 bottle of chilled sparkling wine like Champagne, cava, prosecco, etc. (or use fruit-flavored sparkling wine). Slowly (so it doesn't fizz up too much) stir in 3 cups of cold ginger ale and 2 tablespoons of orange liqueur (such as Triple Sec). Garnish with fresh basil leaves and a couple handfuls of frozen cranberries, strawberries, raspberries, blueberries or a combination. Add some ice to the bowl and serve.